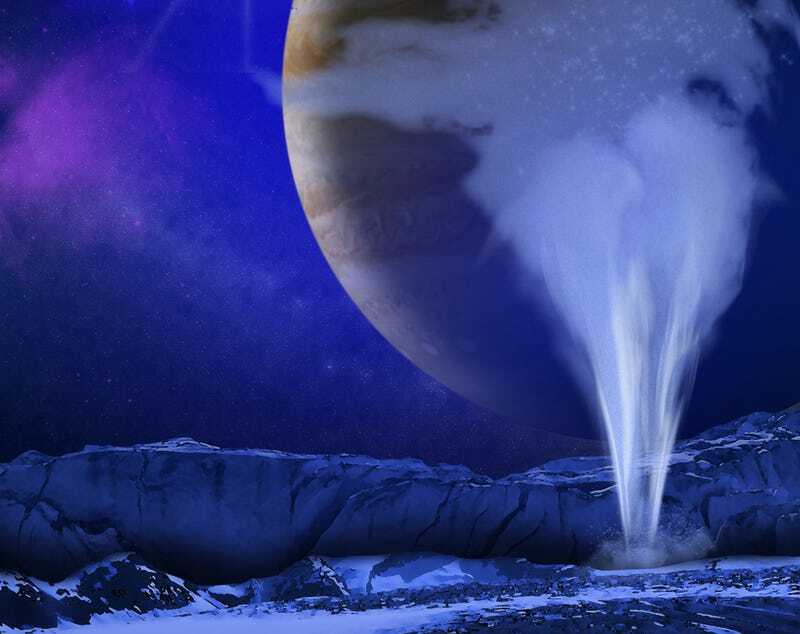 For the first time ever, the Hubble Space Telescope has observed water plumes on the icy crust of Europa. The Jovian moon is one of the most likely worlds to contain life in the Solar System. According to Lorenz Roth—who headed the team that made the discovery—"this is tremendously exciting." No kidding. Above: NASA's artist conception of the water plumes in Europa. By far the simplest explanation for this water vapor is that it erupted from plumes on the surface of Europa. If those plumes are connected with the subsurface water ocean we are confident exists under Europa's crust, then this means that future investigations can directly investigate the chemical makeup of Europa's potentially habitable environment without drilling through layers of ice. And that is tremendously exciting. They have been investigating this since December 2012, according to NASA, to make sure these are actual water plumes and that there's not a "more exotic explanation, such as serendipitously observing a rare meteorite impact." The apparent plume variability supports a key prediction that Europa should tidally flex by a significant amount if it has a subsurface ocean. According to NASA, Europa's water plumes don't escape to space because of its gravity: "Instead, it falls back onto the surface after reaching an altitude of 125 miles, according to the Hubble measurements. This could leave bright surface features near the moon's south polar region, the researchers hypothesize." No evidence of black monoliths yet, David.